Inherent in all these is the danger of enticing readers with the promise of one thing, and delivering something quite different and, arguably, far more challenging. I have no doubt that – despite the complaints – had the novel been promoted as a fantasy (more in keeping with Brogden’s previous novels), there would have been readers who complained that it was a horror novel masquerading as such. This also highlights the genre crossover inherent in the term ‘folk horror’, and hopefully once this term gains a wider currency it will attract more of those readers who revel in the type of twists and terrors on display here. For myself, I found this a marvellous evocation of primal horror, the afaugh a horribly sinister and twisted creation of obsession, myth and hunger. The depiction of Un, which forms the backdrop throughout, is wonderful – mythic, shifting, Jungian and timeless. It owes a large debt to Holdstock, but moves away from the primal nature of the greenwood into a recognisably human landscape, where our remote ancestors first practiced agriculture and tamed the forests, but were still aware that beyond the boundaries of the villages and hill forts lurked ancient forces, darkness and the supernatural. In the final account this is a quest narrative of spectacularly human proportions. Despite the otherworldly narrative of Un, the ancient hunger of the afaugh, it is human mores, flaws and failings that drive the story and bring it to a conclusion (with a Wicker Man like moment of choice along the way). Like the ancient and ineffable past, both of the land and of Nathan himself, the truth lies in the opening sentence ‘it is happening now, as it will go on happening until the end of time.’ Perhaps the scene-shifting of the novel, the way it wrong-foots the reader, may have disconcerted some, but with it we are offered a glimpse of a genuinely primal landscape, mental and cultural, that both welcomed and terrorised our ancestors. Brogden draws us in, and leaves us wondering just what darkness lies beyond the next boundary, and what choices we would make in Nathan’s place. This is a fine, well-crafted novel, and more than repays those readers not afraid to stray beyond the civilised, into the forgotten and liminal. 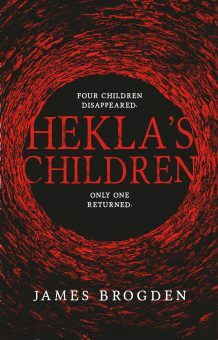 Hekla’s Children by James Brogden, Titan Books, 400pp, pbk, rrp £7.